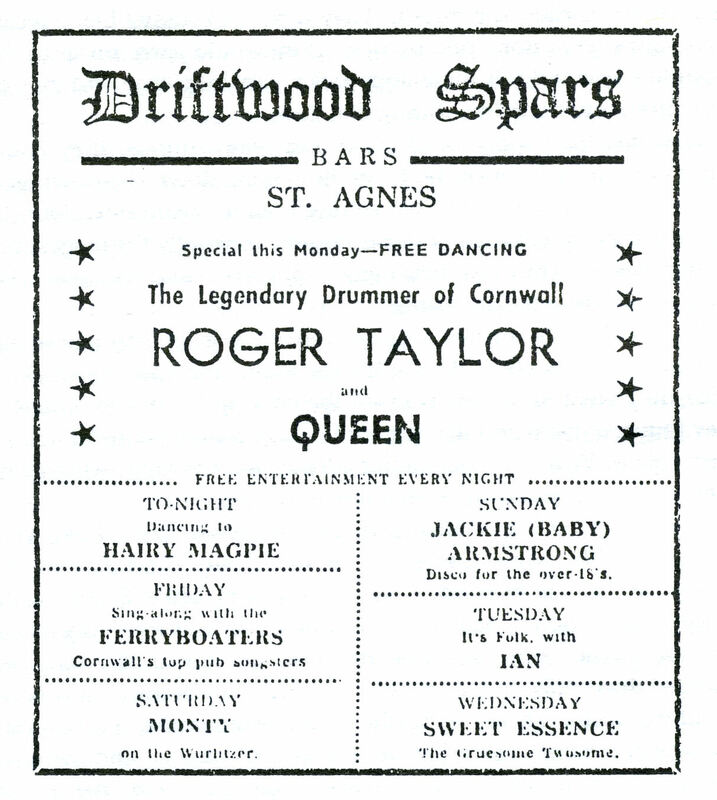 This gig at a small pub, part of the brief "Cornish Tour" (booked by Roger's mum), was one of many billed as "The Legendary Drummer of Cornwall ROGER TAYLOR and Queen" - with Roger Taylor in much bigger letters. This indicates either that he had built a reputation for himself in the county, or that his mother is the one who posted the ads. After the gig, the person who ran the venue refused to pay the band, saying they were rubbish. After a bitter argument, an amount was eventually agreed upon. Interestingly enough, a friend of the band who had followed them from the beginning said this was the first truly excellent show they had ever played. Mark Blake, who wrote the excellent "Is This the Real Life? : The Untold Story of Queen" book, said of the shows in Cornwall, "It seems that it was a home from home for both groups [Smile and Queen], and a place for the bands to practice their act, away from prying eyes in London."